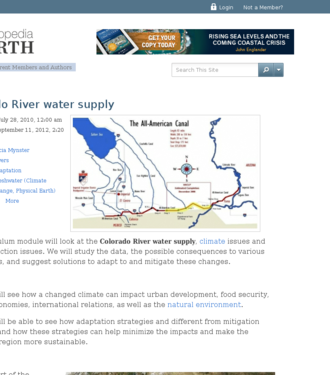 This activity addresses climate change impacts that affect all states that are part of the Colorado River Basin and are dependent on its water. Students examine available data, the possible consequences of changes to various user groups, and suggest solutions to adapt to these changes. 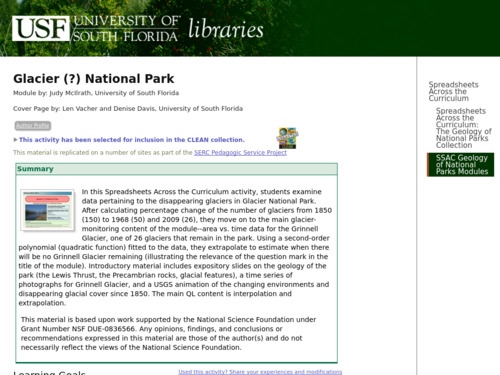 This activity engages learners in examining data pertaining to the disappearing glaciers in Glacier National Park. After calculating percentage change of the number of glaciers from 1850 (150) to 1968 (50) and 2009 (26), students move on to the main glacier-monitoring content of the module--area vs. time data for the Grinnell Glacier, one of 26 glaciers that remain in the park. Using a second-order polynomial (quadratic function) fitted to the data, they extrapolate to estimate when there will be no Grinnell Glacier remaining (illustrating the relevance of the question mark in the title of the module). A detailed Google Earth tour of glacier change over the last 50 years introduces this topic in an engaging way. 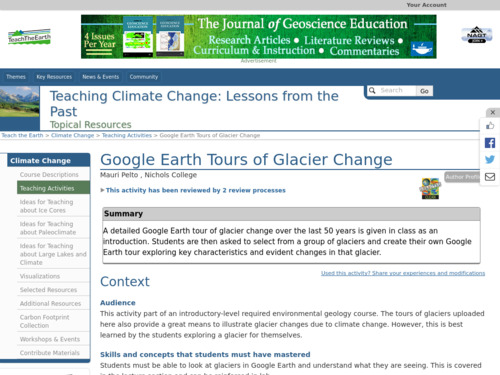 Students are then asked to select from a group of glaciers and create their own Google Earth tour exploring key characteristics and visible changes in that glacier.